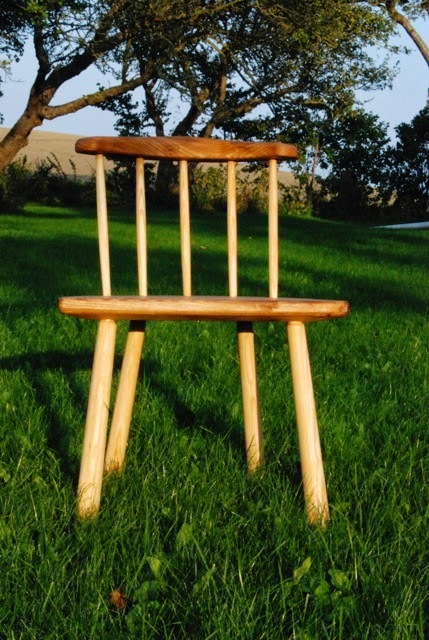 Having recently returned from Denmark where I had the amazing opportunity to build Welsh stick chairs with Jonas from Mulesaw, I thought I might share a few observations I had about the experience, along with how it might change the way I work. I highly recommend taking advantage of any opportunity that comes along to work with others. The solitary nature of wood working is contrary to our ability to absorb information and techniques that one can get in a shop full of other woodworkers. The main thing I learned attending Christopher Schwarz' Anarchist's Tool Chest class was that hand tools are indeed efficient tools to work with. 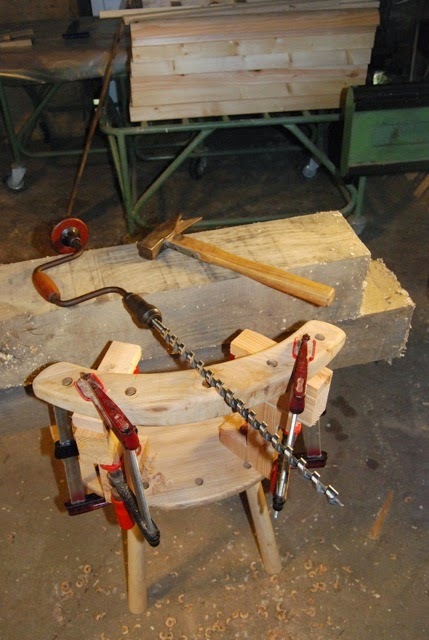 Building chairs last weekend was a great experience in several ways. One of which was the opportunity to work with Jonas and Olav. Olav is a local Danish carpenter who trained in Germany, not far from where I live. He brought a relatively simple tool kit full of user tools. Nothing too fancy, many of them older tools, but everything well maintained and extremely sharp. I'll never forget what he first told me. 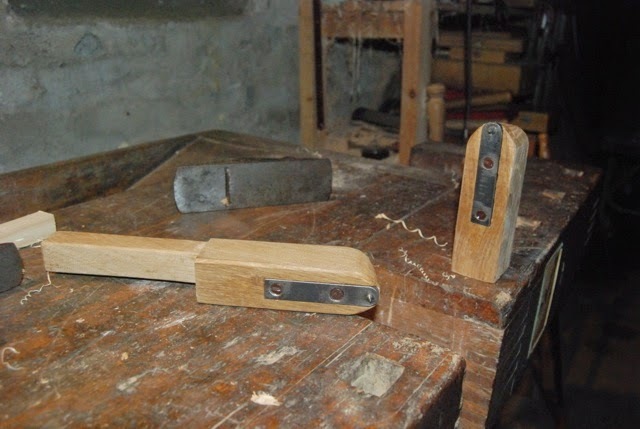 He said it was uncommon for Danish carpenters to have tools made by recent high-end makers such as Lie-Nielsen, because any carpenter worth his salt should be able to tune an old Stanley style plane to work just as well. "Those tools are for amateurs," he said. Look at it this way - how much would those tools cut into a professional's profits when he can probably get just as good of results with flea market finds? This doesn't have to be looked at negatively for us amateurs, though. One thing you are paying for with a new tool is that it is set up and ready to go out of the box. It is important to have a decent tool to learn woodworking with. If you don't know what a decent tool can do, how do you know what needs to be done to tune a vintage tool? Jonas and I failed at trying to steam rived lumber. But, it was fun trying to figure out! Plus, he looks like a badass with a broad hatchet. Watching Jonas work was enlightening in a couple of ways. First of all is his shop. His work area is moderately sized, having enough room for his bench, his hand tools and a mixture of vintage machines including a jointer/planer combo, a table saw, a bandsaw and a lathe. The real beauty of this shop, though, is it is essentially in an entire barn dedicated to woodworking (but I bet he never thought of it that way). Not only is there plenty of storage for wood to air dry, he has two functional lumber mills! One is his 'mule saw,' which has a giant reciprocating blade ideal for flitch cutting logs, and the other is a circular saw blade powered by his tractor, and it is combined with a sliding table that is something like four meters long. This machine is amazing in that it can rip an entire elm log in half in about four seconds. One day while I was trying to decide on what I should use for the center of my laminated arm rail, I found myself with Jonas milling an entire elm log just to get a nice burl piece about 8/4, 4" by 8". I wound up not even using that piece. Normally I buy all of my lumber from a local yard and it is all air dried, and relatively expensive. Jonas will just process a log, stack it up somewhere and in a couple years he'll go through it to find the piece he needs for that project. There really isn't a way I can use that in my 100 square foot shop, but there is something else he did that I can use. Jonas is really fast. My Drew Langsner book said a settee is just like making a chair, except it takes twice as long. Jonas' settee was finished just a couple hours after I left, while there was still plenty for both Olav and I to do before our chairs done. I watched very carefully how he does this, and I think I may have figured it out. When I work, I usually focus on the step I am working on, and when that step is complete, I mentally stand back and congratulate myself before doing a little research on what the next step is. This winds up with consistent results, but is not very efficient. Jonas, on the other hand, tends to move smoothly from one operation right to the next without skipping a beat. 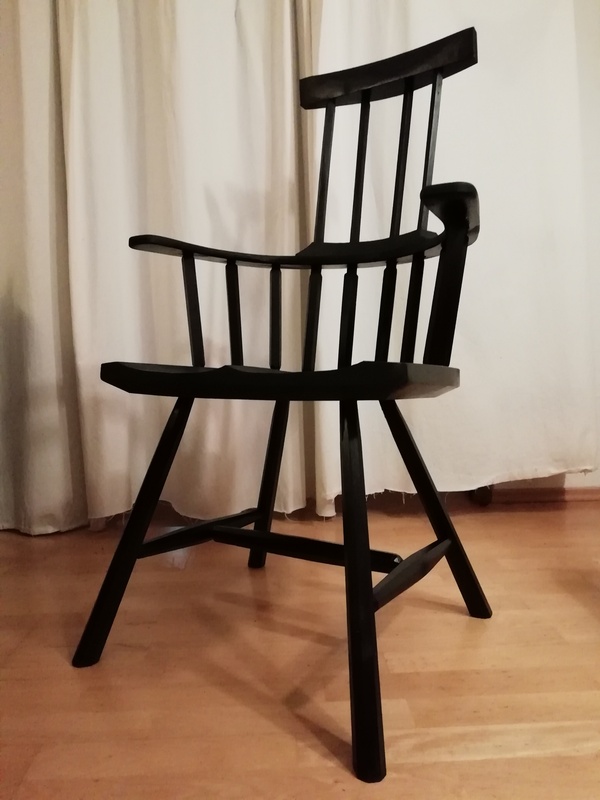 Although none of us had built this style of chair before, he joked before the build that I was going to be the class instructor because I read a book. The book was indispensable, but it was interesting watching Jonas try to figure out his own way of doing things, relying on operations he was familiar with. This was far different from my method of exploring new tools and techniques, many of which didn't exactly work the way I predicted. For example, one day I decided to build a shooting board, because that was the way I would have trimmed the end grain on one of the pieces I was working on. "What do you need that for?" Jonas said. I realized I could make the same cut using my bench hooks laying the plane on it's side directly on the bench. I think a shooting board is an important fixture to have, but if you don't have one, there might be another way to get that step done rather than spend the time building a tool you only need for that one operation. I will implement this way of thinking during my next project. Hopefully it will result in a bit more production in my shop without really changing anything. Day 4 was pretty awesome. In fact, it was so awesome, that we finally drug ourselves inside from the shop around midnight. That made things a bit late to be fair with a proper blog post, so here it is today, instead. I decided to stick around and do a little bit more on day 5 in the morning before packing everything up for the long drive home. Jonas leveling his bench preparing to cut the legs to length. 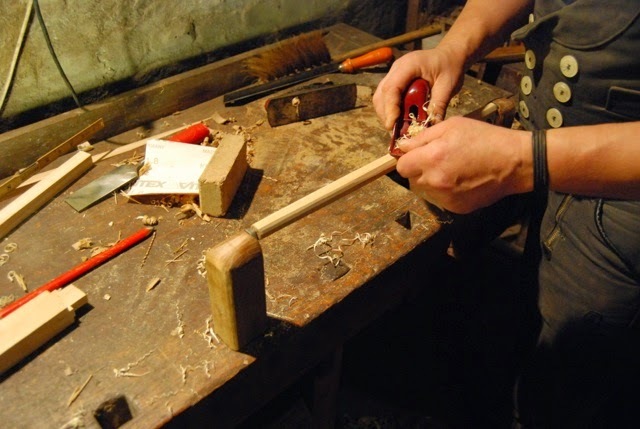 Me gluing a tenon getting with hot hide glue. Jonas is holding the seat stable for me while I pound the legs home. Time to run some stick stock through the planer! Olav working on his legs. Mrs. Mulesaw and Asger trying out Jonas' bench now that it is at final the height. Olav is working on a reproduction from a photograph. It had tapered, round legs. The most efficient way to do this with this splintery ash was to plane them octagonal, and sand them round on the lathe. What a nice coffee table! Us adults didn't hog all of the fun! Here Asger is smoothing a pine board. Half of my sticks are rounded! I found this to be a good technique for shaving thin stock at the bench. I am supporting the thin wood with my thumb, but keeping it behind the blade, otherwise the end of the stick doesn't get shaped. I used a round scraper after shaving. Yes, even professionals refer to the plans every once in a while. Meanwhile, Jonas is moving along. Here is a close-up of a wedged leg near where the hoop pierces the seat. I suppose I should quit goofing off and start working on my arm rail, too! Jonas drilled all of his stick holes by eye. Olav referring to the photo of the original he is reproducing along with the John Brown book. I needed to cut a lap joint for my laminated arm rail. Meanwhile, Jonas is moving right along. That is about as far as we got on day 4, which was officially our last day. But we did get to sneak in a little more work the next morning. Jonas showed me one of his chests that he built out of pallet wood while on board his ship. It is even more impressive in real life than in the photos from his blog! 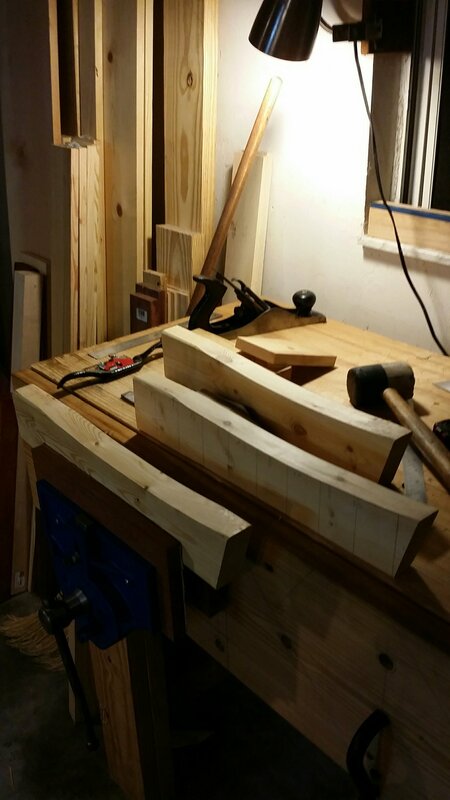 Here is the rough shape of my arm rail. It is resting on some temporary mounting blocks. Jonas' bench all but done. 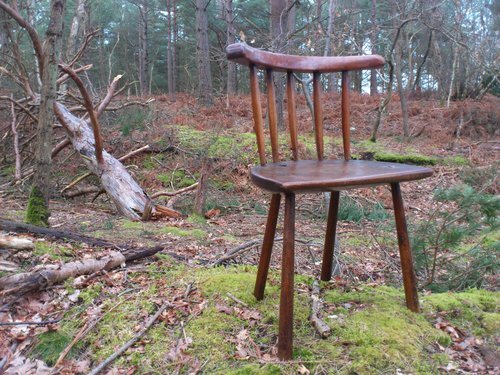 Supposedly a settee takes twice as long as a chair to build. Jonas got farther than I did, and I expect his chair will have finish on it in no time. Time for me to cut my legs to length. Olav testing his seat after cutting his legs to length. At this point I really had to get on the road, so I loaded up the car and took off. Jonas' parents invited me to pop in on them on the way home, which was about two hours away, but on the way home. They have an absolutely gorgeous house converted from an old one-room school house. They have furnished it with a collection of some of the finest Scandinavian furniture I have ever seen. 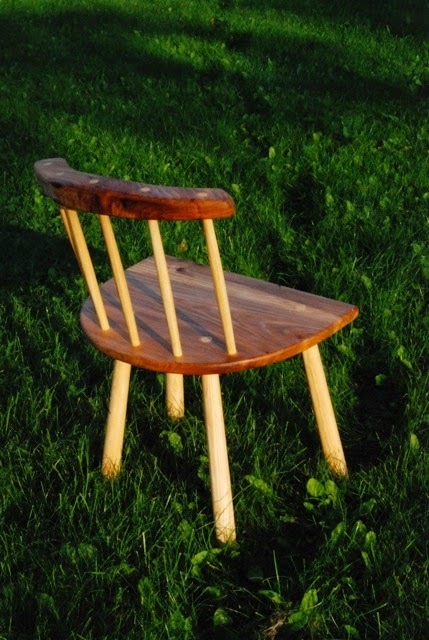 One such piece is this fantastic Windsor rocking chair from Sweden. It is very much like one in a photo of a Swedish Windsor in Drew Langsner's book. I couldn't figure out how the seat was constructed, so I peeked underneath. The seat is actually coopered. 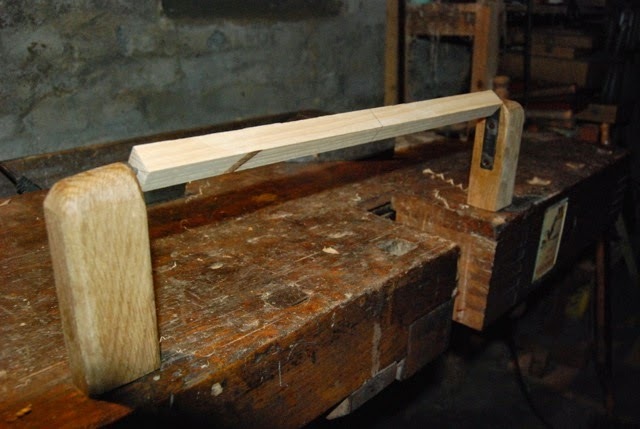 There are several boards glued up at angles with the grain going side to side. 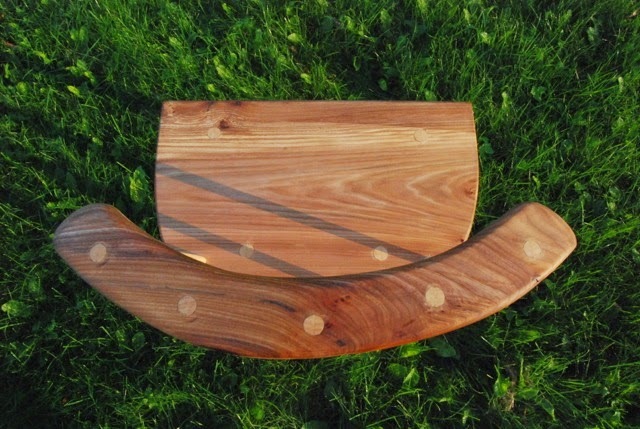 The top is smoothed out and lacquered to complete this dramatic shape. There is only a little left to do on the chair at home before mine is complete. I need to drill the holes and insert the sticks, shape the crest and apply finish. 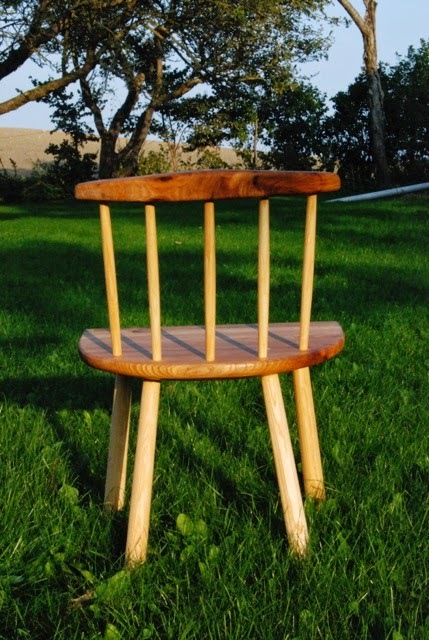 Hopefully I'll get to post pictures of the completed chair soon.